There are many so-called flat areas in the world. In the UK, the county of Norfolk is generally, somewhat disparagingly referred to as being flat: “Oh, Norfolk, yes, it’s terribly flat”. From an alcohol-dulled memory, I seem to recall that the highest point in Norfolk is about 365ft/110mtrs above sea level. The whole of the Netherlands is called flat and it may well be, until you climb aboard a bicycle. 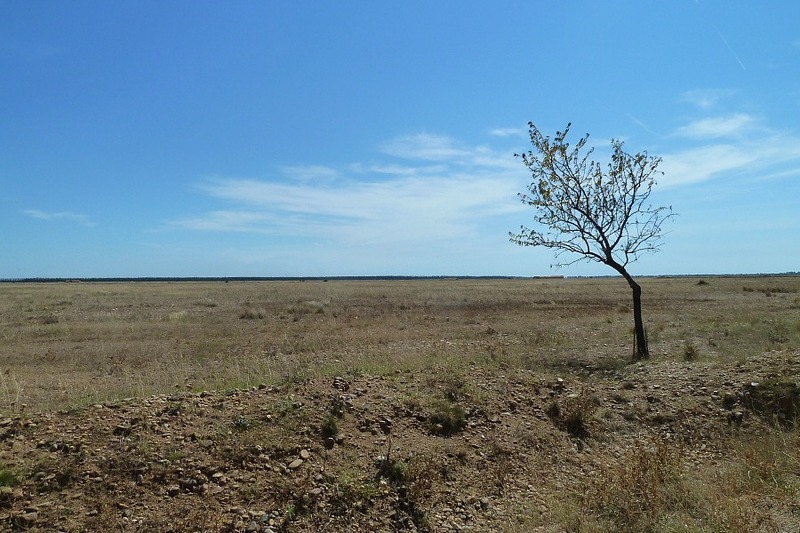 Just south of us and on the east side of the Camargue is an area called La Plaine de la Crau (we suspect, pronounced “crow”). The main town, the gateway to la Crau, is St-Martin-de-Crau. 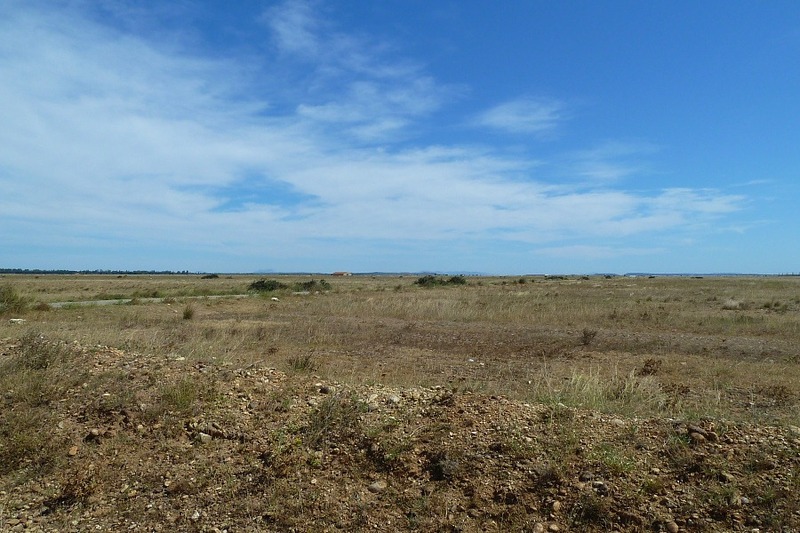 There are many sites of interest to naturalists in la Crau including one called the Peau de Meau requires which is a noted site for birders but also for Odo-nutters. Whilst most areas of la Crau are freely accessible, the Peau de Meau requires a permit (€3 each per day at the time of writing), obtainable from the Ecomusée de la Crau at the western end of the main street in St-Martin-de-Crau. I know it’s at the west end now but, of course, we parked at the east end to begin our search for our permits. No matter, it’s a pleasant-looking town. Permits in hand – well, more accurately, Francine’s handbag – we set off the 10kms/6mls or so in search of the highly regarded Peau de Meau. We found it and it’s definitely not what I expected. I don’t know exactly what I expected but an ironing-board flat stony desert landscape wasn’t it. This is flat; Norfolk and the Netherlands are positively mountainous by comparison. Here are two views looking in almost opposite directions to show you what we’re talking about. Neither does it immediately look like a stunning place for wildlife. We pulled into the car park, where there was nobody to care whether we had a permit or not, and began to stare around. Soon, Francine began spotting flitting Odos, all of which seemed to having some difficulty either flying or hanging onto perches in the strong wind that was whipping across the plain completely unobstructed. The car park is immediately across a small but fast flowing stream/river on the northern side of the Peau de Meau. We did set off on the supposedly 2hrs walk along a stony track around the Peau de Meau but, as you can see from the pictures, life wasn’t going to change much so we soon returned to the most likely Odo habitat, the stream, and I’m very glad we did. Incidentally, given the flat landscape, we’re very confused about how the river managed to flow quite so swiftly. Curious! 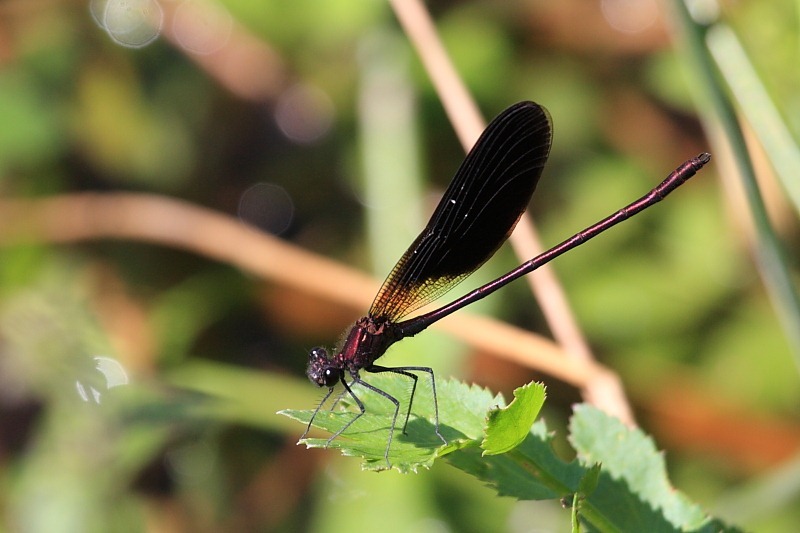 The first thing we spotted over the stream itself was a Copper Demoiselle (Calopteryx hæmorrhoidalis). What a catch, our fourth completely new species and what a stunningly attractive creature the male is. 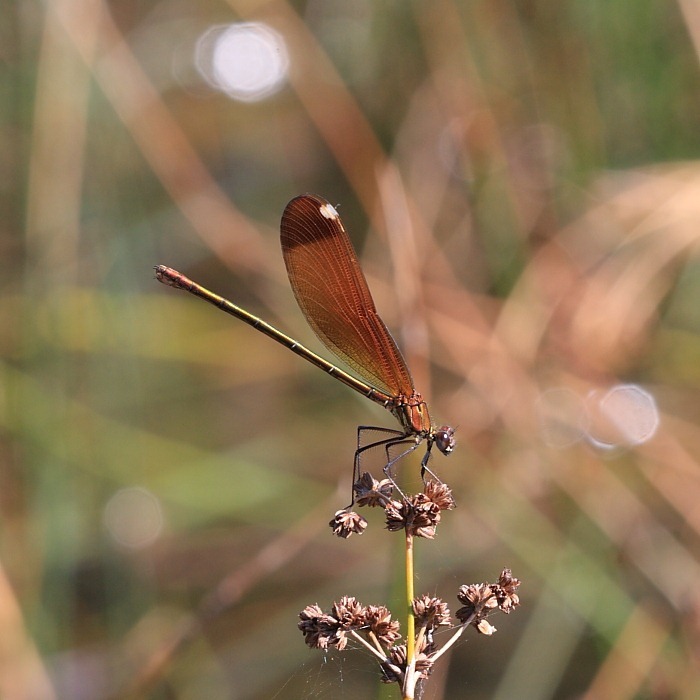 The female is interesting, too, in that she has a darker see-through patch at the tip of one of her pairs of wings. Fortunately I was wearing my Salomon river-guide shoes and was able to clamber into the stream itself to get some reasonably close shots. These Calopteryx chaps and chapesses do tend to make photography difficult by sitting on the sunny side of rivers right over the water.